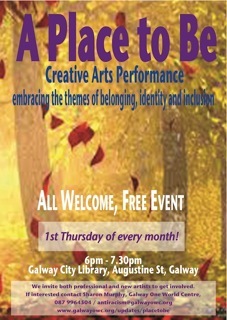 Children’s Library at Galway City Library, St Augustine Street, Galway from 6.00pm to 7.30pm, you are all very welcome to join us in this free event. The full project will start at the beginning September 2014, please go to http://www.bernadettedivilly.com for further details. This entry was posted in Dance, Development Education, Ireland and tagged dance, Galway, Song, Walking Wisdom Woodquay. Bookmark the permalink.